Cherish the moment. It’s Paris, March 1848, just after the February 1848 Revolution, and Hershey Felder as Polish composer/pianist, Fryderyk Chopin, welcomes you into his elegant Paris salon for an unusual piano lesson—one where he does all the playing. It seems like he is making up the music as he goes, and what beautiful music it is—full of delicate dynamics, soft tempo fluctuations, imaginative color and touch—utterly different from any previously existing in the 19th century. Throughout the lesson, he recounts his life story, from his first composition written at age 7 in his Polish hometown of Zelazowa Wola, to his complicated romance in France with the female French novelist, George Sand, to his death at age 39 from tuberculosis, to his heart’s famous burial in Poland. Hypersensitive Chopin’s story is no sweet melody but his pain and losses and moments of epiphany are punctuated with actual shifts in the tone of Chopin’s music. Monsieur Chopin, which opened Sunday, is Berkeley Rep’s latest collaboration with Hershey Felder, who is proving his genius for bringing famous composers to life. Monsieur Chopin, which Felder both wrote and stars in, is directed by Joel Zwick (My Big Fat Greek Wedding (2002), the highest grossing romantic comedy of all time) and arrives at Berkeley Rep on the heels of Hershey Felder as Leonard Bernstein in Maestro (June, 2014) and George Gershwin Alone (June 2013). Monsieur Chopin is part of Felder’s series of musical enactments, “The Composers Sonata” which have been presented at dozens of theatres across the U.S. and around the world. 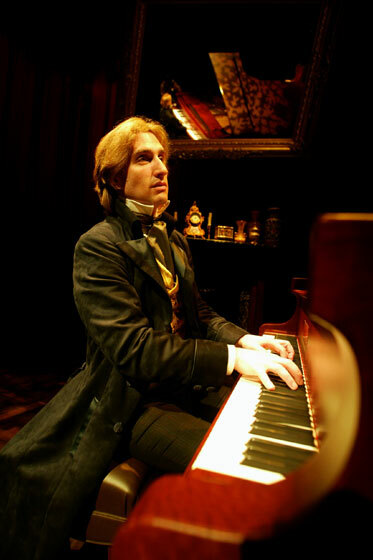 The series also includes Beethoven, As I Knew Him (2008) and Hershey Felder as Franz Liszt in Rock Star (2013). As director, Mr. Felder premiered Mona Golabek in The Pianist of Willesden Lane at the Geffen Playhouse in Los Angeles in April 2012 and the musical biography delighted Berkeley Rep audiences in December 2013 and is now immensely popular in New York. Felder steps into the role of Chopin with complete credibility—from his Polish accent and rendering of Chopin’s artistic temperament to his concert-level playing of some of the most exquisitely lush piano music ever written. He plays selections from some 15 pieces—polonaises, valses, preludes, mazurkas, and nocturnes—and seems to be spontaneously working them into the story as he goes. Felder guides you with information about the inventive and enlivening forms that characterized Chopin’s brilliance—even in his youth, he was keenly aware of the fine-line between improvising and composing—as well as his love of Polish songs and dances. And this is as much the story of music’s golden age as well—an incredibly compressed period, some 200 years— when musical and artistic genius flooded middle Europe. How profound when Chopin says, “When I was 17 and had my debut, Bach had died 78 years earlier.” Bach’s compositional genius influenced him heavily and Bach was an importance point of reference when he was teaching his students. This was also a time when high drama characterized the life of composers and transfixed the public, as much as Hollywood does today. Speaking of transfixed, I wasn’t able to take my eyes off Felder, a natural born storyteller, and I never would have guessed that he has given this performance over 800 times. That he’s of Polish ethnicity, considers Chopin his pianistic home and lives in Paris, and even owns one of Chopin’s pianos, are no doubt huge factors in the attention to detail and care that he has poured into this. We all love a love story and the audience on the edge of their seats as Chopin told of his relationship and semi-guarded Bohemian lifestyle with French novelist George Sand (Amantine-Lucile-Aurore Dupin), a woman whose importance as a writer has been eclipsed by her notoriety for wearing trousers, cigar-smoking and her involvement with Chopin. Strong-willed Sand was painted in broad strokes but we get enough flavor to ascertain that he was attracted to her nurturing and protective side and that she loved him and, for 8 years, tolerated his fragility, mood swings and unpredictability and then, abruptly, she ended it. Chopin’s relationship with Sand is also an effective vehicle for exploring the vibrant environment of the French salon where his small scale piano pieces, most of them brilliantly improvised, were a hit and fundamental to his legacy. “Invention came to his piano, sudden, complete, sublime,” wrote Sand who would frequently lay under the piano as he played for her. Felder’s works a great deal of humor into this piece and his funny and illuminating impressions of the people in Chopin’s life—like the swooning women in his audience or Hungarian composer and pianist, Franz Liszt, Chopin’s biggest “frenemy” in Paris—humanize Chopin and impart information. Liszt attended Chopin’s first concert in Paris and promptly declared him a genius and became his agent, collaborator, friend, and at times, bitter rival for public attention, and oddly, his first biographer. Chopin’s elegant salon (sets by Yael Pardess) is framed by an ornate golden trim, giving it the feel of a romantic period painting to be entered. Chopin’s Steinway and bench are front and center and a lovely fireplace whose mantle is adorned with Sevres style porcelain vases and an ornate clock are behind. There’s a delicately carved wooden table with a pitcher where he fastidiously washes his hands, as if to rid himself of the unpleasant memories he’s just shared. 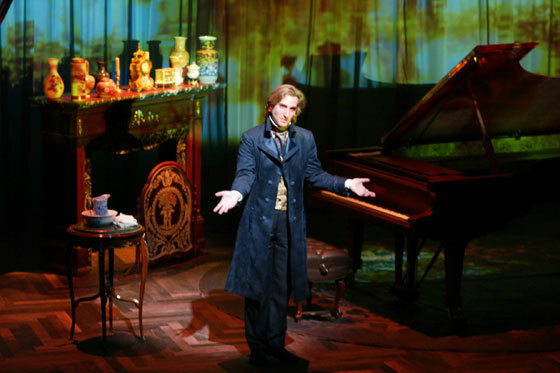 The set also features “smart drapes,” a subtle and elegant scrim for different lighting effects (Richard Norwood) and projections (John Boesche & Andrew Wilder) which change their color hue and design in accordance with various phases of Chopin’s life. In 1829, when Chopin met his first love, a singing student named Constantia Gladkowska, she was dancing a Polish Mazurka and caught his eye. Against spectacular dark lighting, she appears romanticized in a white traditional Polish folk dress, smiling and dancing the Mazurka with other young Polish girls. Felder completes the portrait with his “Mazurka in A Flat Major, Op. 50 No. 2,” a short vibrant piece which concludes in a burst of chromatic harmonies. Sunday’s opening night became even more special when Polish Consul General Mariusz Brymora from Los Angeles, presented Felder with the “Bene Merito” honorary distinction on behalf of the Polish government. Established in 2009, this distinction “is conferred upon the citizens of the Republic of Poland and foreign nationals in recognition of their merits in promoting Poland abroad.” Felder, deeply moved, also received a beautiful Polish woodcut. Following this, Felder/Chopin engaged with the audience in an open Q & A, further revealing his skill as an improvisational performer. The ultimate irony, which I mention in closing, is that this performance nearly sold out before it opened and was extended until August 10 and those performances are nearly sold out. It’s much easier to get people to go to this than an actual Chopin concert. We live in the age of story and it’s the combination of music and story that brings people in. Of course, after experiencing Monsieur Chopin, who could not be hungry for more? Details: Monsieur Chopin runs through April 20, 2014 at Berkeley Repertory Theatre’s Thrust Stage, 2015 Addison Street @ Shattuck, Berkeley, CA 94704. Performances are Tues-Sun with matinees on Sat, Sun and Thursday, August 7.